This week, the Indie Author Spotlight shines on supernatural fantasy author Juli D. Revezzo. 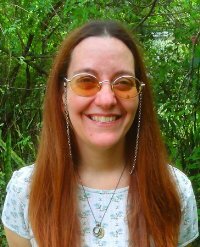 Juli has long been in love with writing, a love built by devouring everything from the Arthurian legends, to the works of Michael Moorcock, and the classics and has a soft spot for classic the “Goths” of the 19th century, in love of which she received a Bachelor’s degree in literature from the University of South Florida. Her short fiction has been published in Dark Things II: Cat Crimes, The Scribing Ibis, Eternal Haunted Summer, Twisted Dreams Magazine and Luna Station Quarterly. She also has an article and book review or two out there. But her heart lies in the storytelling. She is a member of the Independent Author Network. Learn more by visiting Juli’s website, and follow her on Twitter. Settling into a new home, Caitlin notices changes coming over her husband. When nightmares deepen and ghosts begin lurking–Caitlin knows something’s not right, and not just her newfound precognitive abilities. It’s the damned chair her husband’s carving, she’s sure. Could it be just what it seems: a mundane piece of furniture? If so, why is it attracting dark forces–the forces she suspects drove Trevor’s siblings to insanity and suicide? Armed with a handful of allies–a coven of helpful witches–she must proceed with caution against the hellish forces besieging her family. If she fails, she may lose forever the one thing she cares about most: her beloved Trevor. Available for the Kindle and in paperback. A young nobleman escapes the Reign of Terror in 18th century France to find himself dragged into an even worse fate–a hellish underworld wherein he is cajoled and put on trial by a demon tribunal for crimes he never committed. Can he thwart his fate, one worse than the guillotine? Currently available for the Kindle. Both books have the most interesting premise!